Need-based financial aid is a grant awarded to those families who qualify; it is not a loan. 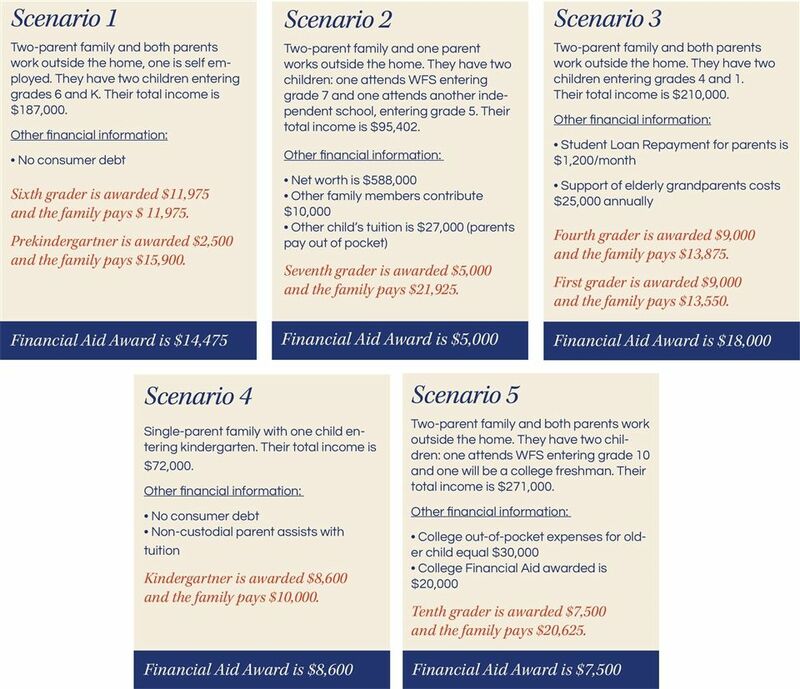 Because financial circumstances vary significantly from family to family, the scenarios presented below are for illustrative purposes to demonstrate a range of incomes and factors that are taken into consideration when financial aid awards are made. Financial aid is available for pre-kindergarten through 12th grade to current Wilmington Friends School families and to those applying for admission. The average financial aid award is $12,308. Financial aid awards are made on a case by case basis to families who have completed a financial aid application, as determined by School and Student Service for Financial Aid (SSS). "Need" covers a wide range, from substantial need to a need for moderate assistance to bridge the gap between what a family can afford and the full cost of tuition. The financial aid committee makes every effort to make a Friends School education affordable for all families. Families receiving financial aid must submit a new application and up-to-date tax returns each year they wish to receive aid. Families who do not qualify or who have been wait listed for financial aid in a given year are welcome to apply again for the following school year. As of October 2, 2018, you may now complete the application online at: SSS for the 2019-2020 school year. Review of the financial aid policies may be useful as you consider applying for financial aid. Please contact Melissa Brown with questions about tuition/affordability, mbrown@wilmingtonfriends.org or 302-576-2932. Timing for Financial Aid Applications: As of October 2, 2018 financial aid applications will be available for completion online for the 2019-2020 school year. The deadline for submitting financial aid applications for the 2019-2020 school year is December 15, 2018. Please call if you have questions about financial aid for the upcoming school year. After-School Program (PS - 6th) $490 - $3,250 annually. In addition to tuition, middle and high school students will incur some additional expenses for text books, supplies, etc. Option 3 Ten monthly payments through Wilmington Friends School Monthly Payment Plan are due beginning May 1 and administered by Smart Tuition. Tuition payments begin prior to the start of the school year, and a non-refundable enrollment deposit is required for every student. A Tuition Refund Plan is available and is highly recommended.